I just realized that despite my gushing over this book, I failed to post the review and interview here that I did for Shelf Awareness for Readers. So, without further ado, a great many words on what I will call the best cookbook of 2015 (and the first cookbook I've ever sat down and read cover-to-cover). This review and interview originally ran in Shelf Awareness' Maximum Shelf on August 26, 2015. 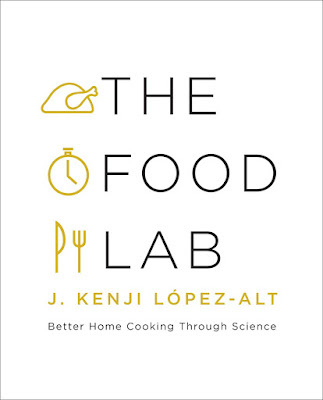 The Food Lab is an impressive tome, more than 900 pages. But unlike other cookbook staples for home cooks--and yes, The Food Lab should definitely be considered an essential volume--it's about far more than recipes. Where The Joy of Cooking and How to Cook Everything are primarily sets of step-by-step instructions for preparing a wide variety of dishes, J. Kenji Lopez-Alt has included a mere 300 recipes in his massive book. The rest of the space is dedicated to exploring the science of food and recipe construction, as well as recommended tools, tricks and techniques. Lopez-Alt was previously editor of Cook's Illustrated magazine and is now managing culinary director of SeriousEats.com, where he authors "The Food Lab" column on food science. The Food Lab draws on those experiences to offer readers a guide to improved home cooking through scientific understanding. In the introduction, he writes, "Being able to identify exactly which parts of a recipe are essential to the quality of the finished product and which parts are just decoration is a practical skill that will open up your opportunities in the kitchen as never before. Once you understand the basic science of how and why a recipe works, you suddenly find that you've freed yourself from the shackles of recipes." In order to do that, one must start with the most basic of basics: a well-stocked kitchen. Therefore, the book opens with recommendations on key kitchen equipment for the home cook (the pots and pans one must keep on hand, which utensils are critical, what unitaskers to skip) and the pantry basics no home kitchen should be without (dairy products, grains, spices and salts, canned goods--and how to store them all appropriately). In both sections, as in dish-specific guides later in the text, Lopez-Alt is conscious of cost, explaining when cost-saving makes sense (a good heavy cleaver, for example, need not be fancy) and where it makes sense to splurge a little (your chef's knife should last a lifetime; a digital thermometer will be your best friend). Though one could dip into and out of each section on a whim, the book's structure allows for cover-to-cover reading--unusual for a cookbook--and the scientific explanations and theories behind each recipe build over the course of the text. The recipe for Buttermilk Biscuits expands on the science explored in the recipe for Buttermilk Pancakes from 20 pages earlier; the 10-page recipe for All-American Meatloaf draws on the scientific exploration of ground meat (including instructions on how--and why--to grind your own at home) found in earlier recipes for homemade sausage; understanding how starch interacts with oil, as explained in a recipe for aglio e olio, is helpful in following the science behind the Ultra-Gooey Stovetop Macaroni and Cheese recipe 40 pages later. Throughout the text, scattered among humorous and engaging anecdotes about his experiences experimenting with food, Lopez-Alt has included asides on techniques and ingredient-specific recommendations. These include little things like how to hold a knife properly; scientific explanations of why cutting meat against the grain yields more tender bites; and handy charts on things like how different additions (milk, water, cream, butter) change the consistency of scrambled eggs and what types of cheeses are best for what applications. While much of this may sound too simple for a practiced home cook, the science behind each recipe ensures that even the most experienced chef will learn something new here. "Once you start opening your mind to the wonders of the kitchen, once you start asking what's really going on inside your food while you cook it, you'll find that the questions keep coming and coming, and that the answers will become more and more fascinating," writes Lopez-Alt. The Food Lab is an invitation to start that questioning. And with a no-fuss, no-frills approach to cooking, The Food Lab promises to become essential for the cookbook shelf, with thoughtful, reasoned explanations for how to make classic American dishes the best they possibly can be. 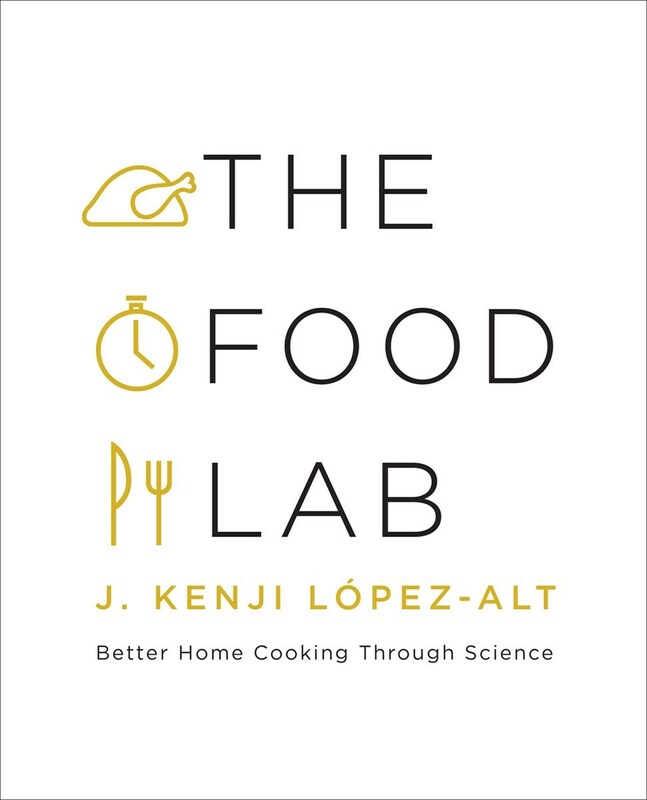 For those interested in the author's words about his cookbook, instead of (or in addition to...) mine, here's my interview with J. Kenji Lopez-Alt about The Food Lab.